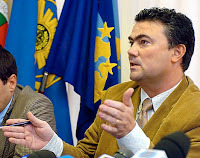 Quote: Carlos Anjos, Polícia Judiciária: "If that situation had been of an abduction, it would have been terrible for the child. Because if that child were to be sold, or something else... She was as good as... it was her death sentence. 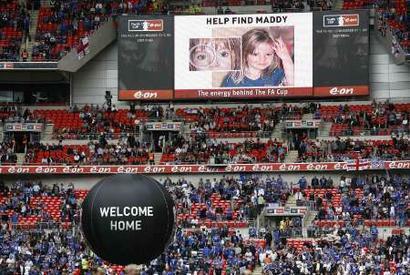 That situation, that day, advertising that photo, was simply the death sentence of that child." 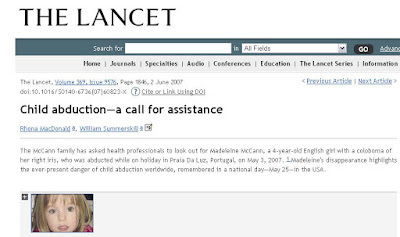 Did Madeleine have a coloboma? "For me this is the most shocking revelation of this whole saga. That means either they knew she could not be found, or they don't want her to be found. No other possibilities." "Missing a diagnosis is bad for a doctor, but making up one, especially for financial gain, is worse." "You couldn't make it up could you? The Bryan Adams song (Look into My Eyes)"
"If I'm honest, we haven't put too much emphasis on her eye"
This is the sort of glaring contradiction that quite frankly, any journo worth their salt should pick up and run with. 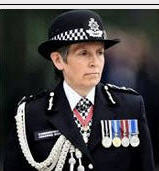 It makes you want to shake the police and say, "look, it's right in front of you, PROOF beyond all reasonable doubt that at the very least the testimony of these people changes". It is the perpetual ignoring of key pieces of spoken contradiction by the Mc's that is so frustrating. Why oh why are the media so spineless? Is every single newspaper being controlled? It's like being trapped in one of those nightmares where you scream and no sound comes out your mouth. I can only hope that there is a long game being played here. I hope someone somewhere is working on all these contradictions. 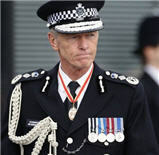 If not it leaves one to believe that the "establishment" are all as thick as the proverbial. I agree - it seems that it makes no difference what the McCanns say even if it's a blatant contradiction to what has been said before, what they say now is their reality. 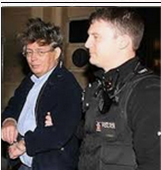 I don't think the establishment are thick as the proverbial - I think they are as thick as thieves! Who else was in on the story? I can excuse the children who were roped into this farce but what about all the adults - friends, relatives, neighbours, medical professionals and parish priests to name just a few? I shall not send it till tomorrow or thursday so if there are objections please let me know. 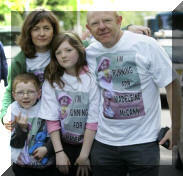 You have my full support PeterMac. It might be an idea to send details of the India sighting and ask how that came about? And the jemmied shutters interviews by all the Team McCann back in the UK and David Payne in interviews in Portugual on the 4th May 2007. 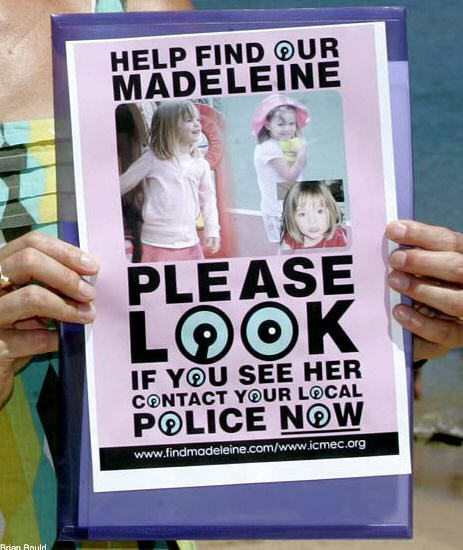 The McCann family has produced a new poster of Madeleine who went missing on the Algarve on Thursday May 3.The photo clearly shows her distinctive right eye, where the pupil runs into the blue-green iris. :: The number telephone number displayed on the poster is for people phoning from within the UK who may have information. 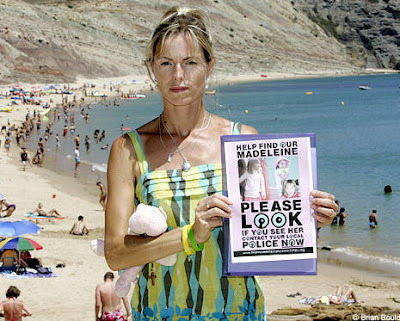 la familia de Madeleine McCann cree que una foto nueva de la desaparecida de 4 años podria jugar un papel vital en su búsqueda. La foto muestra claramente su distintivo ojo derecho, donde su pupila se corre en su iris azul-verde. 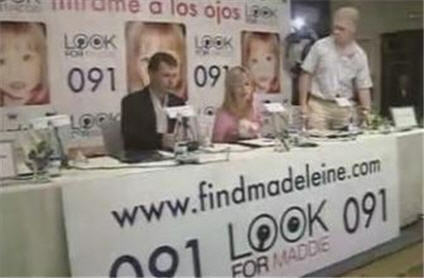 es esta distintiva marca la que identificara a Madeleine con aquellos que la buscan. "Como sabréis mi sobrina, Madeleine, sigue desaparecida y estoy pidiéndoles a todos mis conocidos que envíen una carta cadena, es decir, mandársela a todo el que uno conozca y que a su vez hagan lo mismo, ya que la noticia sólo se conoce en Gran Bretaña, Irlanda y Portugal. No creemos que ella siga en Portugal y necesitamos que su fotografía y su noticia cruce toda Europa lo más rápido posible. Cualquier indicio será bienvenido. 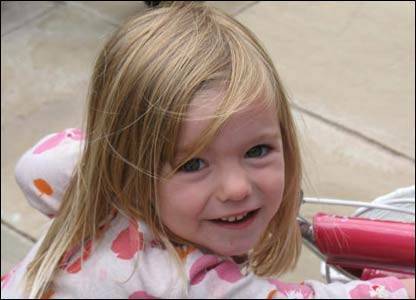 La familia de Madeleine McCann cree que esta nueva fotografía de su hija de cuatro años puede ser vital en su búsqueda. La foto de la chiquilla permite ver claramente un rasgo característico en su ojo derecho [where the pupil runs into the blue-green iris]. El nuevo cartel de Madeleine es una característica distintiva para reconocer a Madeleine por aquellos que la busquen, según sus tíos John y Diane McCann. La pareja de Glasgow tratará de repartir tan lejos como puedan el cartel con la descripción que incluye el teléfono de las fuerzas de seguridad. La Sra. McCann dijo: "La intención del cartel es resaltar la característica especial del ojo derecho de Madeleine. Queremos remarcarlo mucho, porque sabemos que le podrían cortar o teñir el pelo". 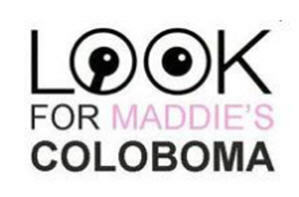 They have not lied about Madeleine's coloboma for the last 4 years. They are lying about it now. They are also lying about not having made a big issue of it, now. Then it was a good marketing ploy. 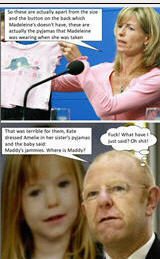 Then it also was, if Madeleine was truly abducted, a death sentence. 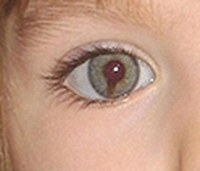 a family member or family doctor has come forward to say there was no coloboma. @lj wrote: Then it was a good marketing ploy. DNA may show that there was an underlying genetic abnormality, - Turners, XO, or whatever. This would not be very unusual in an IVF child. They do show more than the 'normal' number of abnormalities. That would lead to questions about behaviour patterns, learning difficulties, and to the horrifying revelation that Madeleine was not "Perfect" in every way. Coloboma and eye colour change! @PeterMac wrote: So, to sum up. 1)In Kate's book she writes about Madeleine's 'big brown eyes' when she was born. Now I don't think that brown eyes turn green or blue, but the other way round is possible in Caucasian babies. 2)Coloboma: if you look at the little film where she is about 2 (in blue) and of which they have a still on their own website. There's indeed just a fleck to be seen, but no way the thick stripe. In the still there IS a very pronounced coloboma. 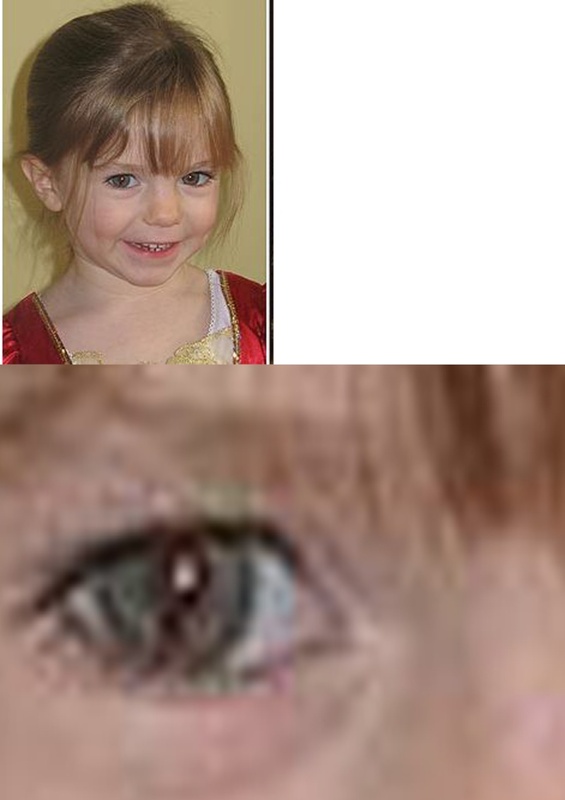 In lots of photographs the coloboma is shopped in, one of the easier things to do with adobe photoshop, but: not always in the same position, 6.00 o'clock, 7 o'clock. Sometimes almost 8 o'clock. Not possible colobomas don't move. There are a few photographs were there is nothing much visible at all. So, I am convinced there was a 'fleck' but nothing more. There were going to be thousands of sightings of little blond girls - but the Team McCann need not fly out to ascertain whether it's Maddie or not! They were way too busy with their tours and interviews. They now NEED sightings. If the Indian one had been halfway true, they'd have been out there in a blaze of publicity. Think of it: once again the disappointment, the hope, the desparate parents. 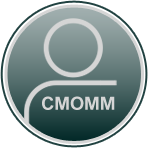 More sightings, more publicity, more attention, more money. Easy. This has always and ever been about the money, IMO. Tigger, I can't find Katie's reference to the big brown eyes, do you know what page it is on? Molly wrote: Tigger, I can't find Katie's reference to the big brown eyes, do you know what page it is on? I'll have a look, I must check it in the library, I quoted from someone who quoted from her book on this site. I believe on the topic of Kate obsessed by beautiful children. Just checked, it's in the 'Book' topic and on page 2 the post and quotes by Peter Mac. All I have done is blow them up. Look closly at the first picture, and the fleck in her eye, and how it is very bendt, and seems like it doesnt belong there. Really looks like it has been put there in a hurry. Also see how it floats over the eyelid..
And then there is this, with clear blue eyes and a good visible fleck standing straight at 6 o clock. And also to the left of the "colomba" is another tiny little fleck, just like someone by accident without noticing made that little fleck there. If you look at the picture in my post before this, the official campaign colomba picture, that little fleck isnt there, and the "colomba" also is not in the same position. There its more 7 oclock. 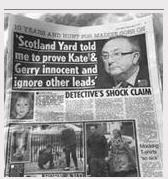 What I wonder is why Kate looks so very young on this picture, it cant be more than 3 years before the trip to PDL. Still she looks ten years younger. 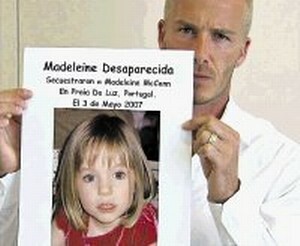 I have yet to find a photo of Madeleine that I beleive has not been photoshopped, or is not her. Ever heard the attraction/distraction method it is very subtle, this instance the eye errors are so designed so you focus on that point (attraction), and fail to look anywhere else(distraction).